Camping de Riquewihr er en campingplass i Riquewihr, Haut-Rhin. Denne campingplassen har steder med avgrensning, med skygge, uten skygge og plasser med noe skygge. Campingplassen har lekeplass og idrettsplass. Denne inspektøren besøker hvert år Camping de Riquewihr og inspiserer campingplassen for ca. 200 fasiliteter og for andre punkt som forekommer. Inspektøren er en medarbeider fra ACSI og arbeider ikke for campingplassen. A well run site in a beautiful area of France. Very clean, modern sanitary blocks. Reasonable sized pitches some in shade. This site was great value for money and the toilet/shower facilities were excellent. Unfortunately there are some negatives, the how to select a pitch was very poorly explained i.e.was it already occupied by a camper van etc. A fairly large number of the pitches were very uneven making levelling quite a challenge !! Our third fantastic stay at Camping de Riquewihr. Staff super helpful and friendly. Very busy the second week of September so arrive early if you haven\'t booked - the site was full every day we were there. Well maintained campsite with great facilities. Very popular so worth making a booking. Some large pitches, mostly slightly sloping. Very friendly staff. When we visited, there were degustations from local wine companies in the evening which were fun to attend. Riquwihr is walkable to visit restaurants or shops, about 15 minutes. Busy but a very chilled time spent here. Toilet block clean and very modern. Large pitches with easy access. Nice service. Beautiful surroundings. Every day a stork came to visit the camp. One of the best sites we visited this five week tour, in fact we visited twice. Really nice helpful staff, fully serviced large pitches, great modern toilets in a quiet location about fifteen minutes walk to the town which is full of good restaurants. lots of pleasant walks and cycle routes. Will come back next time in the area. Very friendly multilingual staff on reception, park, walk round, pick your own pitch, sun or shade. Bread and Bakery products available to order for morning pick up at reception. Most pitches flat and level, with water, drainage and electricity on pitch. We also enjoyed good wifi on our pitch. Toilet and shower facilities new and very clean. Riquewihr a short 10-15 minute walk away with many restaurants, bars and shops etc. We also enjoyed the small craft brewery just outside the town walls. Great site! Bit rustic and natural but everything clean. Very close to the most beautiful villages and great walks. Pitches were a good size. We were entertained every day with visiting storks! We would go again, such a lovely area of France with so much to see and do. Free WIFI! Vil du booke Camping de Riquewihr eller få mer informasjon? Det går bra med opplysningene nedenfor. 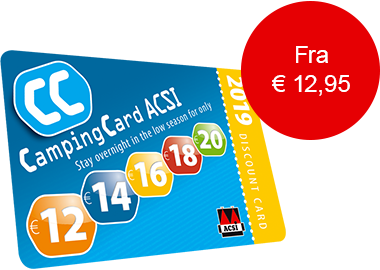 ACSI Eurocampings sender din forespørsel til "Camping de Riquewihr".